I’m not taking on any new commissions at the moment. 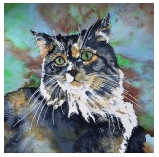 Why commission for your own custom piece of art? 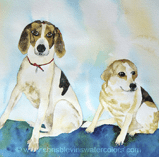 A commissioned watercolor is YOUR original idea we would collaborate on. Together we can create something completely unique for a special occasion, a special person including YOU! Perfect for interior design and custom décor for homes and office. The possibilities are endless only limited to your imagination. Pet portraits are my specialty. Let’s discuss your project today. An original piece of artwork that didn’t exist until I was asked to create it for you. WITH A CHAT. Either in person, on the phone, electronically… We’ll talk so I understand your specific needs and your preferences. That said, any piece of work will still reflect my style which is not Realism (just in case you hadn’t already figured that out…LOL). 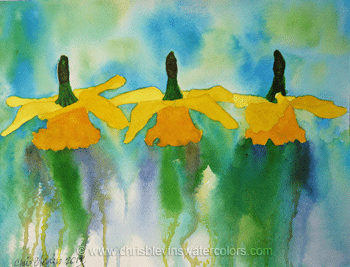 These initial consultations are free even if I think another artist’s work better suits your needs. 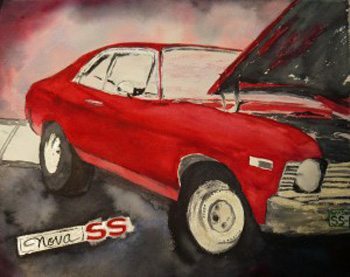 Can I see some past custom art you have created? YES! You can see examples of other commissions here and testimonials from happy clients here. I want to do it, what’s next? DEPOSIT. Make a non-refundable deposit toward your commission to get on my wait list. 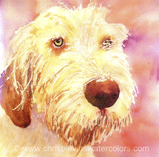 You can make your deposit online here, or send it via PayPal to chris(at)chrisblevinswatercolors(dot)com. Until I receive your deposit, I won’t begin your commissioned artwork. The remainder is due when I complete the painting. IT DEPENDS. I’ve had some take as little as few days, and others up to several months. If you have a hard due date (like a birthday or anniversary), let’s be sure to talk about this so I have a firm deadline to work towards. Other sizes available; ask me for a quote. 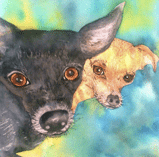 More than one pet in a portrait, there will be additional cost. Let’s talk. Oh, and there’s always that sales tax thing and shipping, if applicable. Make a non-refundable deposit toward your commission to get on my wait list. 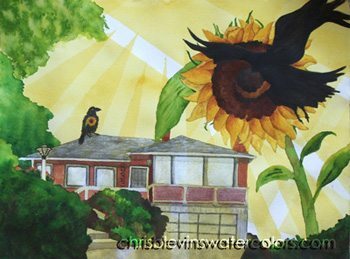 You can make your deposit online here, or send it via PayPal to chris(at)chrisblevinswatercolors(dot)com. Until I receive your deposit, I won’t begin your commissioned artwork. The remainder is due when I complete the painting. Oh, boy. What happens if I don’t like it? You can choose to not purchase the commissioned artwork. In that case, I keep refused artwork and the non-refundable deposit and you don’t owe any additional fees to me. So far, this has never happened. 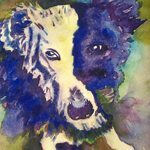 Yes, I have a soft spot for doing pet portraits, but you can see examples of all kinds of my commissioned artwork here.